After a shaky period of getting its legs, The Invisibles enters its third volume with all cylinders firing. 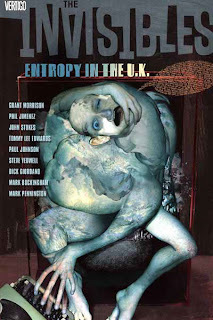 Entropy in the U.K. functions as one of the most successful of the seven volumes that make up Grant Morrison's The Invisibles, a worthy successor to Apocalipstick, and satisfyingly setting up many of the major conflicts to come. "And so we return and begin again." When Entropy in the U.K. begins, King Mob is being tortured by Sir Miles and the minions of Miss Dwyer and the Outer Church. Only problem is, "King Mob" claims that he's just a horror writer named Kirk Morrison, who created King Mob as a character in a book; his memories propose that he's Gideon Stargrave, an anarchist superspy from a parallel reality, while physical evidence suggests he's truly King Mob. With King Mob and Lord Fanny in captivity, the rest of the Invisibles -- Ragged Robin, Boy, Jack Frost (now that Dane has accepted his destiny), Jim Crow, and supercop Mister Six from Division X -- lead an assault on the Outer Church's torture chamber in an attempt to liberate their comrades. Meanwhile, Boy gets a backstory, and we meet the psychedelic cops of Division X and the series' new and perhaps greatest antagonist Mister Quimper. If there's one word to characterize Entropy in the U.K., it's "frenetic." To take a few words from King Mob, it's "nice and smooth." The pace never lets up in this volume; Morrison obviously gets a majority of the credit (as when he plants the seeds of the arc's climax in the inconspicuous "World's Greatest Dad" mug), but new artist Phil Jimenez and returning illustrator Steve Yeowell do bang-up work on the main issues in this collection. It's my contention that Jimenez is the definitive Invisibles artist, drawing clean and detailed treatments of Morrison's script while demonstrating a flair for facial expression and avant-garde paneling. I appreciated the return of Yeowell, though, since his choppier style provides an excellent visual contrast to Jimenez's more restrained artwork on the psychological chapters, with the effect being a sense of chaos loosed upon the narrative. As much as I love Jimenez, I can't imagine, for example, his crisp linework aptly rendering the anarchic intrusion of the King-of-All-Tears in battle against Jack Frost. Fortunately the artists are allowed to play to their strengths, such that the shift might not be immediately noticeable when the art changes in step with the mood. After a few volumes of hesitant marriage between characterization and plot, Entropy in the U.K. finally gives us both without sacrificing one for the other. When Ragged Robin reveals that she was born in 1988 (which should make her no older than seven), it's a brilliant moment of character development that sacrifices none of the narrative momentum, something I can't quite say for "Sheman," as delightful a romp through Lord Fanny's history as it was. Additionally, we finally learn what makes Boy tick; my one reservation about "How I Became Invisible" is its placement in the series, right in the middle of the most exciting storyline to date. It seems that Boy deserves to be more than an aside in this volume (a complaint which one could easily log for Boy's appearance anywhere in the series, especially her conspicuous absence from volume seven), but the positioning of the story in the middle of another arc gives it a bit more suspense than might normally be afforded it. Another word I'd use to describe Entropy in the U.K. is, interestingly enough, "progress." As a series that has occasionally spun its wheels, this volume has with it a sense of positive forward momentum. Many plotlines are resolved -- Dane's identity as Jack Frost -- with our characters fully in their own skin, yet many more new directions are opened. Phil Jimenez's presence gives the series an exciting new visual direction, King Mob's personality shift throughout the rest of the series begins here, our understanding of Sir Miles (in classic Invisibles form) shifts from "villain" to "human," and the introduction of Quimper and Division X completely reshapes the way the rest of the series behaves and -- more importantly -- thinks. Entropy in the U.K. is the Invisibles comic The Invisibles should have been all along. The best, as they say, is yet to be. That's volume three, loyal readers. Stay tuned; up next, the slimmest of seven volumes, Bloody Hell in America, which further opens up new directions for our heroes and for the series as a whole. Read Zach's full Invisibles review series. Coming up later this week, the Collected Editions review of Superman: The Black Ring by Paul Cornell. Entropy in the UK is one of my favorite arcs in the series, and not just because of Jimenez and Stokes' beautiful artwork. We finally get to know King Mob's true (?) story, and the way they torture him with mere words while he resists having layer after layer of his persona peeled off is pure genius. The rest of the volume feels like a big season finale, plus an epilogue. As great as this collection is, the series is about to get even better.